As holiday shopping draws to a close, many have spent countless hours entering stores and boutiques to purchase gifts for family and friends. As consumers, we can choose to purchase products that promote ‘ethical fashion’. Through our shopping decisions and habits we can begin to make better choices to help promote sustainability and ethics in one of the largest industries in the world. ‘Ethical’ fashion is becoming a new focus in various sectors of the fashion industry. Ethical fashion serves as an umbrella term in fashion including a number of issues. Ethical fashion includes: organic, fair-trade, vintage/second-hand, recycling, re-design or ‘up-cycling’, and technology. Ethical fashion is more than just a trend, it is a value shift stemming from informed consumers and value-driven fashion designers and companies. Choosing to buy ‘ethical’ fashion is not about making a right or wrong decision in one’s purchases but rather committing to making an informed decision that coincides with one’s own ethical priorities. Fair trade practices provide fair wages and conditions for workers, farmers, and employees. Fair trade leads to sustainable growth and positive development in local communities around the world. Purchasing vintage/second-hand apparel or recycled or up-cycled garments reduces the environmental impact of production and simultaneously reduces waste. According to some statistics, 90 million items of clothing end up in landfills each year. We can reduce this number by reducing our purchases of ‘disposable’ fashion and focus on thinking before we buy. As informed consumers, we can think about where and how the product came into being, by whom and under what conditions the product was made, and how long we will personally use the product. Answering these questions will help us to understand the consequences of a single consumer’s choice. Also, as informed consumers we have the power to vote. 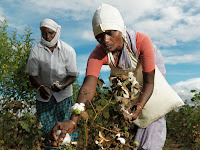 We vote with each ‘ethical’ fashion purchase, we vote to infuse a greater social and environmental responsibility into the fashion industry with each fair trade, eco-friendly purchase.